The Awarua Communications Museum holds items relating to public communications in Southland and New Zealand, the basis of which comes from the role of the New Zealand Post and Telegraph Department - later renamed the New Zealand Post Office (NZPO). This site deals mainly with the NZPO's Engineering function and its role in providing public communications services in Southland and further afield. 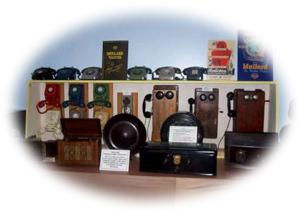 The Museum hosts items and displays which tell the story of early telegraphy, wired telephone, and early radio technology. It also displays more modern communication technologies. 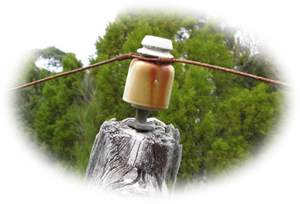 As well as viewing equipment displays, visitors can learn about the evolution of communications, such as is recorded in the story of 'the worst telephone line in the country' - a saga of maintaining a telephone line through the southern coastline bush and how it was eventually replaced by a radio communication link. Other items on display show early telephone equipment from party-line phones housed in wooden cabinets, to black bakelite phones with ringer handles and dials, to coloured phones with curly-cord handsets. The museum collection is catalogued and will be recorded online. When that has been completed, the catalogue may be reviewed on e-Hive - select the link in the sidebar. 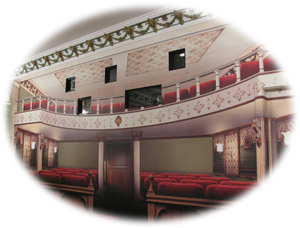 A significant feature of the museum is The Regal theatre - a replica of a private theatre that once operated in Invercargill. A descendant of the founder of that theatre is a member of the Museum and has an active role in presenting film and video as his ancestor did. The selection of film content available for private viewing is wide and can be tailored to the interests of groups and clubs. The Museum display is relatively static, but film features can be optimised to suit the interests of clubs and groups. We welcome inquiries about how we may support your group's activities and interests.